Tap into your whimsical side, with this Picnic & Beyond willow basket. This beautiful, suitcase-style design includes everything you need for a four-person picnic, such as settings, glasses and napkins. 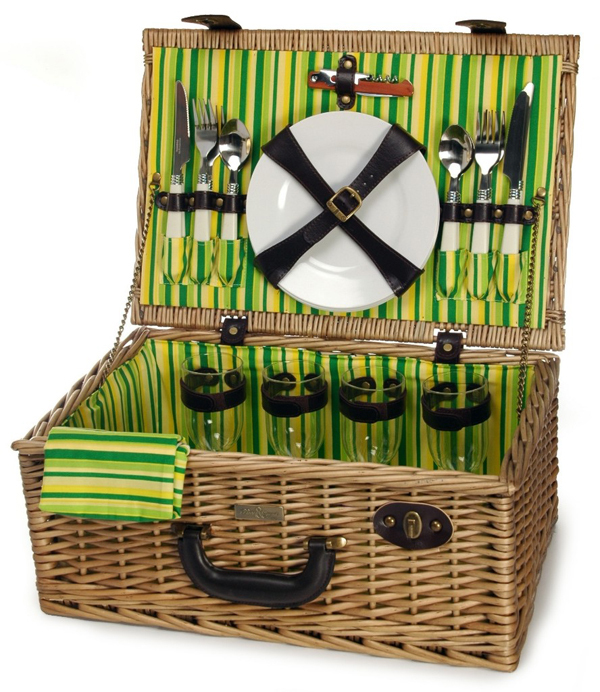 With this amazing picnic basket in your house, you'll never have another excuse to stay indoors. 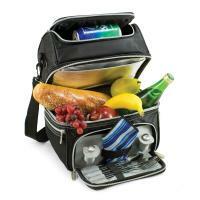 The picnic basket is very nice a very good value for the money. Like others, I do wish the plates were bigger. They are fine for appetizers or dessert, but they really are too small for a dinner portion. Each item is very nicely made, and the basket is well crafted. I am very pleased. 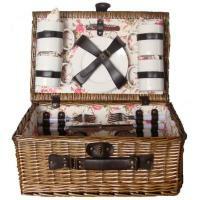 Beautiful picnic basket! We take it out on our boat and picnic wherever we dock! Thanks! 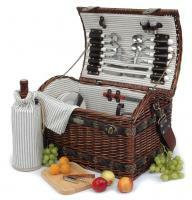 Has everything needed for a great picnic all wrapped up into a beautifully crafted basket. Thanks Picnic World! 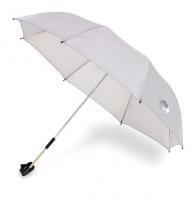 I was very satisfied with my purchase from your web site from the time I placed my order until I received it. I am very satisfied with the purchase and the quality of your basket. I would highly recommend your web site to anyone that might ask. I gave the basket as a Christmas gift, my son and daughter in law love it, they are looking forward to being able to use it in the summer. I received this item very quickly which was great because it was a gift for my sister who was in town for a brief amount of time. She loved it and said it was perfect for her, her husband and their two boys. This was a gift to my brother and sister-n-law in GA. Shipped directly to them. They really are impressed with the entire picnic basket. I ordered a 4 person picnic basket for a gift.The quality of the basket was great. The contents were a nice color combination. I'm sure it will make a nice gift. The product is beautiful, but I was really disappointed that the handle on the basket is in the most awkward place so it isn't convenient to carry.